The following figures give the formula for the circumference of circle. Scroll down the page for more examples and solutions. Examples, videos, worksheets, stories and songs to help Grade 6 students learn about the Circle: Area, Circumference, Radius, Diameter. How to find circumference of a circle given the radius or diameter? 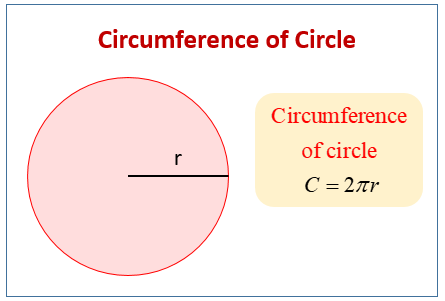 The circumference of a circle is the distance around the circle, and the formula for the circumference of a circle is 2 times pi times the radius of the circle. Find the circumference of a circle given the diameter. This video gives severals examples of the process used to find the circumference of a circle.